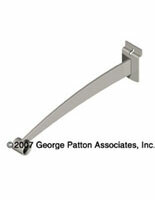 These hang rails are just one of the many available slatwall accessories in our online catalog! Shop over 150+ slatwall fixtures as well! 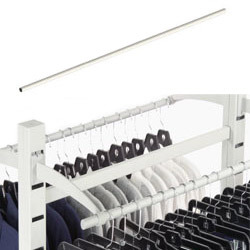 These hanging rods are perfect hang rails for large quantities of clothing. Our 48" hang rails, also known as hanging rods, will hold shirts, shorts, pants, dresses, intimates, skirts, or suits. The hang rails are held about 1 ft. away from the slatwall by hang rail holders (sold separately). This allows ample room to hang a variety of clothing. Our hang rails are heavy-duty and able to hold up to 100 lbs. of clothing. Use these hang rails, along with some of our other products, such as the SG19SP, and SW166SP to create a highly useful and versatile clothing rack (pictured on left). 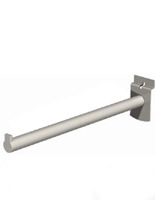 Simply hook two hang rail holders (SW166SP) into our slatwall unit (SG19SP) and insert the rails into the brackets. 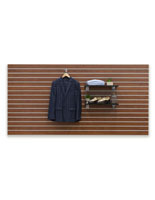 The hang rails become the perfect display for your top selling items! 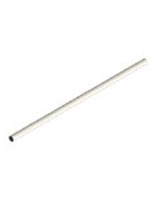 These hanging rods are the perfect hang rails for retail clothing stores! These hangrails are designs to work best when used with support brackets (sold separately).